Dazzling lilac blooms edged with white lacing will captivate and raise your displays to the next level! A new colour addition for 2018. A super addition to beds and borders. Striking lilac flowers edged with silver-white. Deightful in a pot as a specimen plants. Supplied as 12x Jumbo Plugs ready for growing on. A popular and striking polyanthus, 'Lilac Lace' is an exquisite new colour addition to this popular favourite, and will delight you with its gorgeous lilac flowers - each delicate petal laced in silver-white and surrounding a sunshine-yellow centre. Really something special, 'Lilac Lace' produces masses of flowers which are carried on long elegant stems which emerge from bold, textured foliage. The plants are best appreciated in small groups at the edge of flowerbeds or in pots. A spring-flowering, winter-hardy perennial, 'Lilac Lace' is a great solution for autumn and winter containers where the luxurious foliage will add texture and interest before bursting into flower in the spring. Beautiful in a pot or displayed in a small flower vase, you can also grow these plants indoors - until they reach eight to 10cm in height, when you should transfer them outdoors. Supplied as 12x Jumbo Plugs ready for potting up and growing on. Supplied as 12 x Jumbo Plug Plants ready for potting up and growing on. To prolong flowering, remove spent flower heads and remove any yellow leaves. 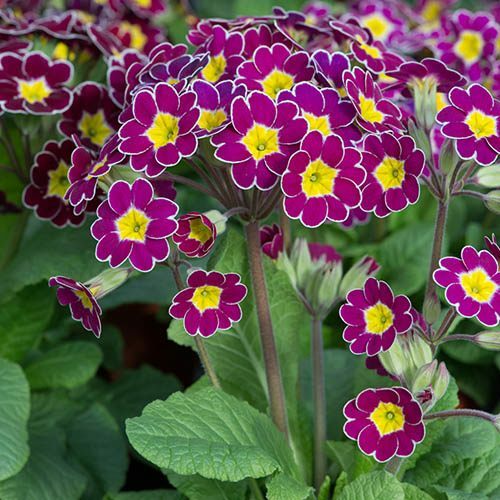 Primulas enjoy moist, well-drained soil. For best results, plant out from mid-September to early October. If planting in a container, fill with multipurpose compost about three quarters full. Remove the plant from its existing pot or tray and carefully place into position. Add the remaining soil to the plant pot and press firmly into place then water well. If planting in the ground, dig a hole the same size as the plant’s root ball. Place the plant in position, firm down the soil and water immediately.